Thank you to everyone who came out to celebrate the 4th Annual Music for MDA! Thanks to your generosity, we were able to raise nearly $5,000 to help support the programs and services offered by MDA. to raise awareness, support, and money for the Muscular Dystrophy Association. Musicians are the heart and soul of Music for MDA, and we are so very grateful for the extraordinary kindness and generosity of the many musicians and friends who have helped to make Music for MDA concerts a reality, and in the process have become co-fighters against neuromuscular diseases. If you can't make it to the concert, but would still like to make a donation, you can do that here! All contributions are, of course, tax deductible. We are grateful for your generous support and most importantly, for your help in making a difference in the fight against all neuromuscular diseases. 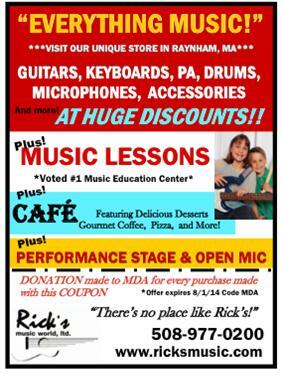 Visit Rick's Music with THIS coupon before August 1st!